Just like fashion, mixed metals are making it into our lives at home. And, just like fashion, it can be tricky mixing metals. We are seeing more and more lighting that mixes metal finishes and clients are often quite taken with them. For years we banned brass thinking it looked dated. So unfair. I think it was just that shiny finish that dated the bright brass chandeliers found in most homes during the 70’s and 80’s. We are seeing stunning brass in fixtures now, unpolished with beautiful hand-rubbed finishes like Tori by Murray Feiss. 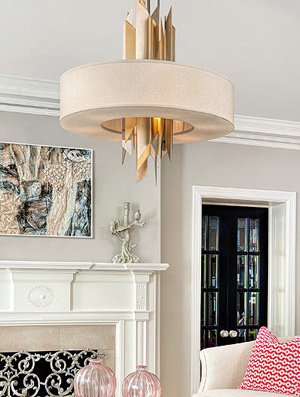 Another favorite is Hubbarton Forge’s slash of brass accenting a bronze finished hand-forged steel fixture called Cosmo. In itself Cosmo is a lesson in mixing metals and how bronze finishes mix it up with other metals. 2-4 metals in the mix is a good rule of thumb. Too many finishes and you lose the taste factor somehow. Mixing metals creates layers of “look” within your décor. Be careful not to define these layers or you’ll end up with an ugly mash-up. Similar types of metal work easily together. Think of a marriage of gold and rose gold, for example. Mix metals that are warm in tone like gold, brass, bronze and rose gold. The fun happens when you mix contrasts. Recently we had a firsthand look at a mini-reno in a customer’s master bath. It started with a Kohler faucet that mixed chrome and brass. This customer’s bathroom was all unpolished brass except for the chrome and brass faucets and she was tired of it. She was taken with the polished chrome look and swapped out the brass sconces when she fell for some Hudson Valley chrome lighting fitted with chunky glass accents. But she retained the chrome and brass faucets and unpolished brass hinges on the shutters and doors. It added some sparkle and somehow made a feature of the unpolished brass. Gorgeous. That’s a great example of the 2/3 to 1/3 rule… one finish dominates and the other plays a supporting role. You’ll find your mix is easier to get right with this approach. Want to try something fun and new? Try mixing copper fixtures with dark bronze. Or consider painted finishes on lighting mixed with chrome on drawer pulls. We are loving the look of dark bronze in our mixed metals. Why? Dark bronze sort of tones down the shine on too much polished chrome in a kitchen. It’s that layering that makes the mix. We have some wonderful pieces in our showroom right now, with new lighting coming in every day. Take pictures of what you have and how it looks now. Then bring your pics on your phone or iPad to the showroom and let’s see what happens!